If you’re selling your iPhone on eBay or craigslist you have to make sure you completely erase all your personal information. If you do not erase all the data from your iPhone the new buyer could potentially access your passwords, email accounts, facebook, etc. 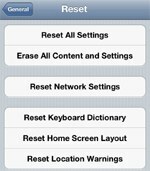 Follow these simple steps below to ensure all your iphone information is erased. 1. Make sure all of your iPhone personal data is safely backed up to either iTunes or iCloud. 2. 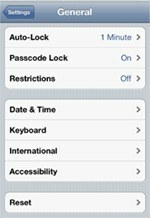 Click the settings icon on your iPhone screen. 3. Click the general info tab. 4. Click the reset tab. 5. You will then see a few different options. Click the one that says “Erase All Content & Settings”. Warning: this will erase everything on your iPhone including email, phone numbers, text messages, etc. so make sure you have backed up your info as suggested in step 1 and you’re sure you really want to erase everything before clicking. 6. Click the red button that says “Erase iPhone”. 7. Confirm on the screen that you want to erase all your data. 8. Patiently wait for all the data to erase. This could take up to two hours. Your iPhone will reboot after the process is completed. After the reboot your iPhone has been restored to the factory default setting and your person information has been erased.